New analysis of Pluto’s atmosphere explains why New Horizons spacecraft measured temperatures much colder than predicted. The gas composition of a planet’s atmosphere generally determines how much heat gets trapped in the atmosphere. For the dwarf planet Pluto, however, the predicted temperature based on the composition of its atmosphere was much higher than actual measurements taken by NASA’s New Horizons spacecraft in 2015. A new study published November 16 in Nature proposes a novel cooling mechanism controlled by haze particles to account for Pluto’s frigid atmosphere. The cooling mechanism involves the absorption of heat by the haze particles, which then emit infrared radiation, cooling the atmosphere by radiating energy into space. The result is an atmospheric temperature of about 70 Kelvin (minus 203 degrees Celsius, or minus 333 degrees Fahrenheit), instead of the predicted 100 Kelvin (minus 173 Celsius, or minus 280 degrees Fahrenheit). According to Zhang, the excess infrared radiation from haze particles in Pluto’s atmosphere should be detectable by the James Webb Space Telescope, allowing confirmation of his team’s hypothesis after the telescope’s planned launch in 2019. 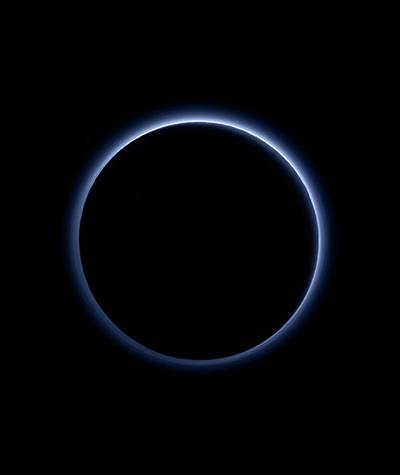 Extensive layers of atmospheric haze can be seen in images of Pluto taken by New Horizons. The haze results from chemical reactions in the upper atmosphere, where ultraviolet radiation from the sun ionizes nitrogen and methane, which react to form tiny hydrocarbon particles tens of nanometers in diameter. As these tiny particles sink down through the atmosphere, they stick together to form aggregates that grow larger as they descend, eventually settling onto the surface. “We believe these hydrocarbon particles are related to the reddish and brownish stuff seen in images of Pluto’s surface,” Zhang said. The researchers are interested in studying the effects of haze particles on the atmospheric energy balance of other planetary bodies, such as Neptune’s moon Triton and Saturn’s moon Titan. Their findings may also be relevant to investigations of exoplanets with hazy atmospheres. Zhang’s coauthors are Darrell Strobel, a planetary scientist at Johns Hopkins University and co-investigator on the New Horizons mission, and Hiroshi Imanaka, a scientist at NASA Ames Research Center in Mountain View, who studies the chemistry of haze particles in planetary atmospheres. This research was funded by NASA. Geologists at UC Santa Cruz investigated glacial polish from Yosemite National Park to understand how it formed and what it can tell them about how glaciers move. The glaciers that carved Yosemite Valley left highly polished surfaces on many of the region’s rock formations. 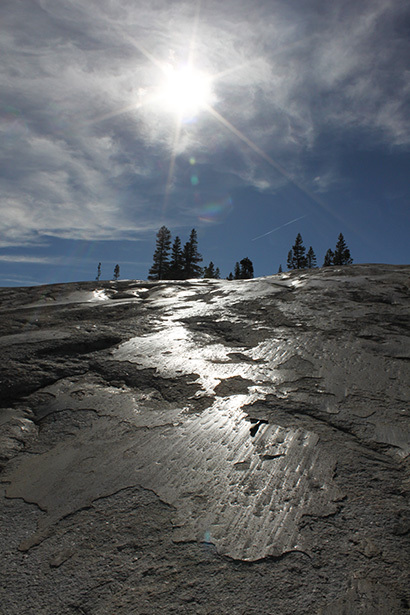 These smooth, shiny surfaces, known as glacial polish, are common in the Sierra Nevada and other glaciated landscapes. Geologists at UC Santa Cruz have now taken a close look at the structure and chemistry of glacial polish and found that it consists of a thin coating smeared onto the rock as the glacier moved over it. The new findings, published in the November issue of Geology, show that the polish is not simply the result of abrasion and smoothing by the glacier, as was previously thought. Instead, it is a distinct layer deposited onto the surface of the rock at the base of the glacier. This smooth layer coating the rock at the base of glaciers may influence how fast the glaciers slide. It also helps explain why glacial polish is so resistant to weathering long after the glaciers that created it are gone. According to coauthor Emily Brodsky, professor of Earth and planetary sciences at UC Santa Cruz, this ultrathin coating can help glaciologists better understand the mechanics of how glaciers move, and it provides a potential archive for dating when the material was pasted onto the rock. Lead author Shalev Siman-Tov, a postdoctoral researcher at UC Santa Cruz, had previously studied the highly polished surfaces found on some earthquake faults. To investigate glacial polish, he teamed up with Greg Stock, who earned his Ph.D. at UC Santa Cruz and is now the park geologist at Yosemite National Park. He and Stock hiked into Yosemite National Park to collect small samples of glacial polish from dozens of sites. They chose samples from three sites for detailed analyses. One site (Daff Dome near Tuolomne Meadows) emerged from beneath the glaciers at the end of the last ice age around 15,000 years ago. The other two sites are in Lyell Canyon near small modern glaciers that formed during the Little Ice Age around 300 years ago. Lyell Glacier is no longer active, but McClure Glacier is still moving and has an ice cave at its toe that enabled the researchers to collect fresh polish from an area of active sliding and abrasion. The researchers used an ion beam to slice off thin sections from the samples, and they used electron microscopy techniques to image the samples and perform elemental analyses. The results showed that the tiny fragments in the coating were a mixture of all the minerals found in granodiorite bedrock. This suggests a process in which the glacier scrapes material from the rocks and grinds it into a fine paste, then spreads it across the rock surface to form a very thin layer only a few microns thick. “Abrasive wear removes material and makes the surface smoother, while simultaneously producing the wear products that become the construction material for the coating layer,” the researchers wrote in the paper. Siman-Tov now wants to date the layer and confirm the time when the glacier eroded the rock surface. He is also conducting laboratory experiments to try to recreate the same structures observed in the coating layer. The researchers will continue to work with Stock in Yosemite to study the chemical weathering of glacial polish surfaces compared to regular, exposed granodiorite. In addition to Siman-Tov, Stock, and Brodsky, the coauthors of the paper include geologist Joseph White at the University of New Brunswick. This work was funded in part by the Gordon and Betty Moore Foundation and the National Science Foundation. One of the great things about science is that the money we invest in research often brings a return through commercially useful discoveries or advances that improve the quality of life for us all. Even in my field of astrophysics, research discoveries have been made that led to huge practical benefits. For example, Wi-Fi, which all of us use every day, is the result of CSIRO mastery of fourier techniques that were being used for both astrophysics and applied research. But astrophysics also reveals inherent wonders about the universe, and in this past year we have hit some phenomenal goals. On October 17, for the first time, scientists measured the violent death spiral of two dense neutron stars — the dense cores of stars that have exploded and died — as they collided at nearly the speed of light, creating what many called the greatest fireworks show in the universe. Astronomer Ryan Foley says “observing the explosion of two colliding neutron stars” [see https://sciencesprings.wordpress.com/2017/10/17/from-ucsc-first-observations-of-merging-neutron-stars-mark-a-new-era-in-astronomy ]–the first visible event ever linked to gravitational waves–is probably the biggest discovery he’ll make in his lifetime. That’s saying a lot for a young assistant professor who presumably has a long career still ahead of him. A neutron star forms when a massive star runs out of fuel and explodes as a supernova, throwing off its outer layers and leaving behind a collapsed core composed almost entirely of neutrons. Neutrons are the uncharged particles in the nucleus of an atom, where they are bound together with positively charged protons. In a neutron star, they are packed together just as densely as in the nucleus of an atom, resulting in an object with one to three times the mass of our sun but only about 12 miles wide. “Basically, a neutron star is a gigantic atom with the mass of the sun and the size of a city like San Francisco or Manhattan,” said Foley, an assistant professor of astronomy and astrophysics at UC Santa Cruz. These objects are so dense, a cup of neutron star material would weigh as much as Mount Everest, and a teaspoon would weigh a billion tons. It’s as dense as matter can get without collapsing into a black hole. Like other stars, neutron stars sometimes occur in pairs, orbiting each other and gradually spiraling inward. Eventually, they come together in a catastrophic merger that distorts space and time (creating gravitational waves) and emits a brilliant flare of electromagnetic radiation, including visible, infrared, and ultraviolet light, x-rays, gamma rays, and radio waves. Merging black holes also create gravitational waves, but there’s nothing to be seen because no light can escape from a black hole. Foley’s team was the first to observe the light from a neutron star merger that took place on August 17, 2017, and was detected by the Advanced Laser Interferometer Gravitational-Wave Observatory (LIGO). Now, for the first time, scientists can study both the gravitational waves (ripples in the fabric of space-time), and the radiation emitted from the violent merger of the densest objects in the universe. It’s that combination of data, and all that can be learned from it, that has astronomers and physicists so excited. The observations of this one event are keeping hundreds of scientists busy exploring its implications for everything from fundamental physics and cosmology to the origins of gold and other heavy elements. A small team of UC Santa Cruz astronomers were the first team to observe light from two neutron stars merging in August. The implications are huge. It turns out that the origins of the heaviest elements, such as gold, platinum, uranium—pretty much everything heavier than iron—has been an enduring conundrum. All the lighter elements have well-explained origins in the nuclear fusion reactions that make stars shine or in the explosions of stars (supernovae). Initially, astrophysicists thought supernovae could account for the heavy elements, too, but there have always been problems with that theory, says Enrico Ramirez-Ruiz, professor and chair of astronomy and astrophysics at UC Santa Cruz. A theoretical astrophysicist, Ramirez-Ruiz has been a leading proponent of the idea that neutron star mergers are the source of the heavy elements. Building a heavy atomic nucleus means adding a lot of neutrons to it. This process is called rapid neutron capture, or the r-process, and it requires some of the most extreme conditions in the universe: extreme temperatures, extreme densities, and a massive flow of neutrons. 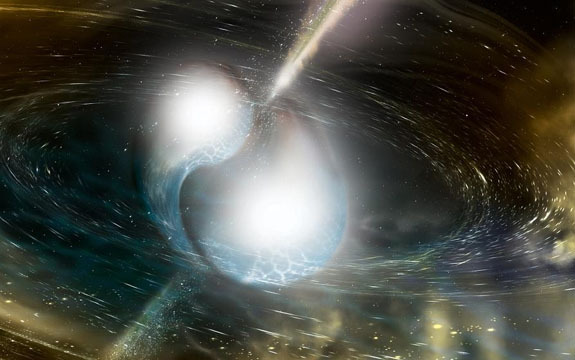 A neutron star merger fits the bill. Ramirez-Ruiz and other theoretical astrophysicists use supercomputers to simulate the physics of extreme events like supernovae and neutron star mergers. This work always goes hand in hand with observational astronomy. Theoretical predictions tell observers what signatures to look for to identify these events, and observations tell theorists if they got the physics right or if they need to tweak their models. The observations by Foley and others of the neutron star merger now known as SSS17a are giving theorists, for the first time, a full set of observational data to compare with their theoretical models. According to Ramirez-Ruiz, the observations support the theory that neutron star mergers can account for all the gold in the universe, as well as about half of all the other elements heavier than iron. Einstein predicted the existence of gravitational waves in 1916 in his general theory of relativity, but until recently they were impossible to observe. LIGO’s extraordinarily sensitive detectors achieved the first direct detection of gravitational waves, from the collision of two black holes, in 2015. Gravitational waves are created by any massive accelerating object, but the strongest waves (and the only ones we have any chance of detecting) are produced by the most extreme phenomena. Two massive compact objects—such as black holes, neutron stars, or white dwarfs—orbiting around each other faster and faster as they draw closer together are just the kind of system that should radiate strong gravitational waves. Like ripples spreading in a pond, the waves get smaller as they spread outward from the source. By the time they reached Earth, the ripples detected by LIGO caused distortions of space-time thousands of times smaller than the nucleus of an atom. The rarefied signals recorded by LIGO’s detectors not only prove the existence of gravitational waves, they also provide crucial information about the events that produced them. Combined with the telescope observations of the neutron star merger, it’s an incredibly rich set of data. LIGO can tell scientists the masses of the merging objects and the mass of the new object created in the merger, which reveals whether the merger produced another neutron star or a more massive object that collapsed into a black hole. To calculate how much mass was ejected in the explosion, and how much mass was converted to energy, scientists also need the optical observations from telescopes. That’s especially important for quantifying the nucleosynthesis of heavy elements during the merger. LIGO can also provide a measure of the distance to the merging neutron stars, which can now be compared with the distance measurement based on the light from the merger. That’s important to cosmologists studying the expansion of the universe, because the two measurements are based on different fundamental forces (gravity and electromagnetism), giving completely independent results. Not only did we see the collision, we could hear it as the two stars, each the size of a city, completed 4000 orbits in the last 100 seconds of their cosmic dance. It was a landmark discovery from an international team that included almost 100 Australian scientists and it resonated with the public in a way that only black holes, dying stars and fireballs in the universe can do. It was science at its most impressive, almost inconceivable yet intensely fascinating. It also reminded us that basic science — the science that isn’t immediately geared towards industrial applications — remains immensely important. A century ago, Albert Einstein realised that gravity could be mimicked by acceleration — that light bent when passing near massive objects, and that the fabric of space-time could be shaken by the acceleration of the stars and planets. A natural consequence of his theory was that stars beyond a certain density would collapse to become black holes, terrifying objects that possessed such strong gravity that not even light could escape them. He also predicted that the stars and planets emitted a strange and mysterious new form of radiation known as gravitational waves. But was Einstein right? Did black holes exist and did his equations correctly describe their behaviour? Does time really stand still in their vicinity and do gravitational waves permeate the universe? These are questions that are incredibly fundamental to how the universe ultimately works but that Einstein thought were impossible to verify experimentally. It appears completely ludicrous to even think about trying to do experiments on black holes when you realise that you’d have to shrink the Earth into a ball just 2cm in diameter for it to become one. For our sun the black hole diameter seems more achievable, more like 6km — except when you learn that the sun weighs about 300,000 Earths and about 18 billion tonnes has to fit in every cubic centimetre. This year’s Nobel prize winners in physics (Rainer Weiss, Kip Thorne and Barry Barish) realised that it was possible to build a machine that could hypothetically detect colliding black holes or their ultra-dense cousins, neutron stars, in the nearest million galaxies — should they exist and ever collide. Their detector, called Advanced LIGO, was the first to have a realistic chance of detecting the ripples in space-time induced by Einstein’s gravitational waves. The technology behind this facility is staggering. More than 1000 people from around the world have contributed to the instruments, which fire powerful lasers at pairs of mirrors (beautifully polished in Australia) hanging from complex suspensions 4km away in the world’s largest vacuum tubes. Australia is one of four countries in the project. When Advanced LIGO began its science operations in September 2015, it started listening for tremors in the fabric of space-time for the first time. Remarkably, it wasn’t long before LIGO saw a burst of gravitational waves from two black holes as they destroyed each other in the last few orbits of a death spiral that probably had been under way for billions of years. Black holes are deceptively simple objects, defined by their mass, spin and charge, and the pair involved in the September 2015 event were about 1300 million light years away. Their detection proved that gravitational waves existed and that black holes 30 times the mass of our sun did too. For the first time scientists got to experiment with gravity in the vicinity of a black hole. In August this year the first pair of merging neutron stars were seen by LIGO. Neutron stars are so dense that a teaspoon weighs a billion tonnes, but when they collide they produce an explosion that briefly creates a fireball in the sky. This event proved Einstein’s postulate that the speed of gravity and the speed of light were equivalent, to four parts in 10,000 trillion — one of the most precise confirmations of a physical law in the history of physics. Last Thursday the Australian Research Council Centre of Excellence in Gravitational Wave Discovery was opened by federal Education Minister Simon Birmingham. The centre, which has been operating since April, has been born in a year that will likely go down in history as a monumental one for astrophysics. The existence of the centre, and the excitement surrounding gravitational wave science, is testament to those who believe that basic science, the science of discovery, is a goal unto itself. This year, the LIGO gravitational wave detectors acted like a stethoscope, allowing us to listen to the vibrations in the fabric of space-time. The appeal of the resultant science — which may not have any immediate monetary worth — is fascinating because it is truly universal, intangible and priceless. Swinburne is a large and culturally diverse organisation. A desire to innovate and bring about positive change motivates our students and staff. The result is in an institution that grows and evolves each year. August 17 dawned as the first day in an otherwise ordinary observing run for Texas A&M University astronomer Jennifer Marshall. She had arrived in Chile a few days earlier as part of another routine visit to the National Optical Astronomy Observatory’s (CTIO), distinguished solely by the fact that it happened to kick off the fifth and final year of the Dark Energy Survey (DES), a five-year international project led by the U.S. Department of Energy’s Fermi National Accelerator Laboratory to map one-eighth of the sky in unprecedented detail. However, just as swiftly as day turned to night and darkness descended over the Andes Mountains, Marshall found herself at the fateful crossroads of proximity and cosmic history, courtesy of one universally significant target of opportunity observation. By virtue of being in the right place at the right time, Marshall got to witness firsthand the fiery aftermath of a recently detected burst of gravitational waves, personally recording some of the initial images of the first confirmed explosion from two colliding neutron stars ever seen by astronomers. The discovery, historic because it marks the first cosmic event observed in both gravitational waves and light, was made using the U.S.-based Laser Interferometer Gravitational-Wave Observatory (LIGO); the Europe-based Virgo detector in Italy; and more than 60 ground- and space-based telescopes. During the course of seven days in Chile, Marshall watched the extraordinary event play out in real time through two telescopes — the 4-meter Victor M. Blanco Telescope at CTIO, then moving on to the 6.5-meter Magellan Telescope at nearby Las Campanas Observatory. She was the only astronomer present and observing for DES at Blanco during the unprecedented occurrence. Walter Baade telescope in the right dome. The building connecting the two domes serves as a storage area for various instruments and a maintenance facility for realuminizing the mirrors. Note the tall, slender silo next to the domes. This is a differential image motion monitor (DIMM) telescope used to measure atmospheric seeing. Images taken by Marshall using the 570-megapixel Dark Energy Camera (DECam) captured the flaring up and fading over time of a kilonova — an explosion similar to a supernova but on a smaller scale — that occurs when collapsed stars, called neutron stars, crash into each other, theoretically creating heavy radioactive elements. This particular violent merger, which occurred 130 million years ago in a galaxy (NGC 4993) relatively near our own Milky Way galaxy, is the source of the gravitational waves detected by the LIGO and the Virgo collaborations on Aug. 17. Although this is the fifth source of gravitational waves to be detected, it is unique because it is the first one with a visible electromagnetic counterpart observable by optical telescopes — the glowing aftermath of the collision of two neutron stars — as opposed to binary black holes, which are not expected to produce a remnant that can be seen through telescopes. When DES officials at Fermilab learned along with dozens of LIGO-affiliated collaborations and observatories around the world that a strong gravitational signal, named GW170817, had been detected at 7:41 a.m. CDT by two of LIGO’s three detectors — a find further corroborated by a gamma-ray burst detected by NASA’s Fermi Gamma-ray Space Telescope at roughly the same time — they sent out a target of opportunity observation notice that Marshall quickly seized upon. As she was observing at Blanco, Marshall was simultaneously collaborating via Skype with fellow DES scientists Marcelle Soares-Santos (Fermilab/Brandeis University), the DES principal investigator in charge of gravitational wave observations, and Daniel Holtz (University of Chicago), who is a member of both LIGO and DES. 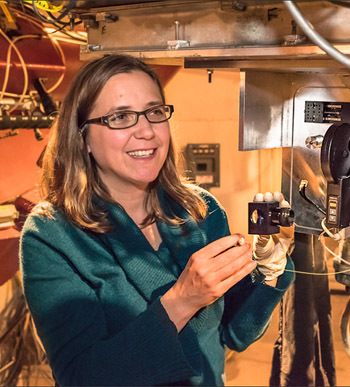 Coincidentally, Marshall also was sharing some of those nights via remote with Ting Li ’16, who earned her doctorate in astronomy at Texas A&M in 2016 working with Marshall and currently is a Lederman Fellow in Experimental Physics at Fermilab. Armed with the crystal-clear images from DECam, for which Texas A&M astronomer Darren DePoy served as project scientist, Berger’s team went to work analyzing the phenomenon using several different resources, including NASA’s Hubble Space Telescope and Chandra X-ray Observatory. For her part, Marshall continued imaging the galaxy for five more nights at CTIO, watching the event fade rapidly and change in color from blue to red as the explosion quickly cooled down. She then spent a seventh night at Las Campanas, doing follow-up observation with the Magellan telescope, using a different spectrometer to enable more detailed study of the event in collaboration with Carnegie Observatories scientists Maria Drout and Ben Shappee. Jennifer Marshall may have been one of many astronomers observing GW170817 from both ground- and space-based telescopes on Aug. 17, but she likely was the only one who happened to have a film crew in tow. Check out this video produced by NOVA PBS, present at CTIO at the time, shooting footage for an upcoming segment on the Dark Energy Survey. Catch Marshall at the 0:45, 1:10 and 1:42 marks! Understandable excitement aside, Marshall says this event is particularly interesting to her because it is directly related her research on r-process elements — the heavy elements that exist on Earth and are produced in theory as the byproducts of neutron star collisions and mergers. These observations show that the theory is accurate, providing the final piece of the puzzle regarding the origin of r-process elements. Marshall said one indication of just how well LIGO/Virgo is working is the amount of event follow-up requests, which are so numerous as a result of its second and most recent observing run since being upgraded via a program called Advanced LIGO that astronomers have been forced to prioritize. In addition to Marshall and DePoy, fellow Texas A&M astronomers and Mitchell Institute members Lucas Macri, Casey Papovich, Nicholas Suntzeff and Louis Strigari are full members of the 400-plus-member international DES collaboration that spans 26 institutions and seven countries as well as the gamut of science and engineering in the search for answers regarding the universe’s accelerated expansion. Texas A&M statistician James Long and Mitchell Institute Postdoctoral Fellow Peter Brown also are external collaborators. The LIGO-Virgo results are published today in the journal Physical Review Letters, while additional papers from the LIGO and Virgo collaborations and the astronomical community either have been submitted or accepted for publication in various journals. Six papers relating to the DECam discovery of the optical counterpart are planned for publication in The Astrophysical Journal. Preprints of all papers are available online. Marshall’s observations made during that fateful August week in Chile appear in a total of nine publications making their debut today, including the mega paper from LIGO that includes citations for 75 associated papers, in addition to two DES-related papers appearing in The Astrophysical Journal as well as two papers in the journal Science featuring the Las Campanas spectra and images. Beyond those, she is an author on three additional DES papers, including one that uses the binary neutron star merger event to derive the Hubble constant. DePoy and Li join her as co-authors on several of those papers by virtue of their status as fellow DES Builders. Finally, she is an author on the Transient Optical Robotic Observatory of the South (TOROS) Collaboration paper in The Astrophysical Journal Letters. Read more on today’s announcement and its broader significance in the official press releases from LIGO/Virgo , DES/Fermilab, which include additional images along with animations and videos and from From UCSC: “Neutron stars, gravitational waves, and all the gold in the universe”, which tells the optical astronomy part of the story. This last, written by Tim Stephens is quite a production, complete with a 2.5 hour video of the press conference is not to be missed. Learn more about the Texas A&M Astronomy Group’s broader role in the imaging and analyses. For more information about Texas A&M astronomy, visit http://astronomy.tamu.edu. Located in College Station, Texas, about 90 miles northwest of Houston and within a two to three-hour drive from Austin and Dallas. Home to more than 50,000 students, ranking as the sixth-largest university in the country, with more than 370,000 former students worldwide. Holds membership in the prestigious Association of American Universities, one of only 62 institutions with this distinction. Has an endowment valued at more than $5 billion, which ranks fourth among U.S. public universities and 10th overall. Astronomer Ryan Foley says observing the explosion of two colliding neutron stars–the first visible event ever linked to gravitational waves–is probably the biggest discovery he’ll make in his lifetime. That’s saying a lot for a young assistant professor who presumably has a long career still ahead of him. So what makes this strange cataclysm in another galaxy so exciting to astronomers? And what the heck is a neutron star, anyway? The world’s big astronomical telescopes could soon all get a performance upgrade without the need for installing bigger mirrors, thanks to a collaboration between materials scientists and astronomers at the University of California, Santa Cruz, in the US. One key property of the mirrors used in astronomical telescopes is, of course, reflectiveness. Another, however, is durability – and the intersection of the two represents a trade-off. Most big telescopes use mirrors coated in aluminium, which is a comparatively tough material that can survive the sometimes harsh environments in which observatories are situated, as well as being able to withstand the potentially damaging effects of being manhandled. Silver makes for a much more efficient mirror because it is much more reflective. However, it is also fragile, and prone to damage and corrosion. Tackling this problem after a conversation with a despairing astronomer, a team led by materials scientist Nobuhiko Kobayashi has formulated a tough but ultra-thin coating that can keep silver protected without reducing or distorting its reflective properties. The team formulated several new alloys, using various combinations of fluoride, magnesium and aluminium oxides. These were then deposited on a silver surface, using an electron beam, in a molecule-by-molecule process called atomic layer deposition. The best-performing formulation – which rejoices in the name MgAl2O4, Al2O3 – enabled high reflectance at wavelengths between 340 nanometres and the mid-infrared spectrum. It remained stable even when exposed to 80% humidity and 80 degree Celsius temperatures for 10 days in a row. Both the specific formulation and the application method have been patented by their inventors. The mechanical limit of the process at present means the largest mirror that can be coated has a diameter of 0.9 metres. Kobayashi and his colleagues are working on doubling this – an upper limit, they say, that will allow the mirrors in even the world’s largest telescopes to be converted to silver. The main mirrors of the Keck Telescope in Hawaii, for instance, comprise a 10-metre span, but are made up of 1.8 metre-wide components. The research is published in the SPIE Digital Library. Published as part of the THE World University Rankings 2018, the analysis measured overall research influence based on the average number of citations per paper, using a database of almost 62 million citations to more than 12.4 million research publications published over five years, from 2012 to 2016. With a citation score of 99.9, UC Santa Cruz is tied for third place with Stanford University. St. George’s University of London and the Massachusetts Institute of Technology were tied for first. 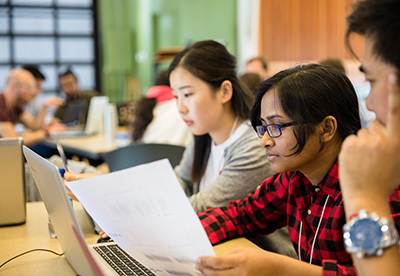 UC Berkeley ranked just behind UCSC and Stanford with a citation score of 99.8. The 2018 rankings list the top 1,000 universities in the world, comparing them in five areas: teaching (the learning environment); research (volume, income, and reputation); citations (research influence); international outlook (staff, students, and research); and industry income (knowledge transfer). UCSC’s overall ranking in the THE World University Rankings 2018 was 162 out of 1,000 institutions worldwide. In the United States, UC Santa Cruz ranked 55 out of 154 institutions. An international training program for the Thirty Meter Telescope (TMT) project brought more than 40 graduate students and postdoctoral researchers to UC Santa Cruz in August for an eight-day scientific and technical workshop. Workshop participants, representing all of the TMT International Observatory’s partners (Canada, China, India, Japan, UC, and Caltech), worked on projects in small teams, visited astronomical laboratory facilities, toured Lick Observatory, and met with numerous scientists and engineers involved in TMT. At a symposium on August 25, TMT project manager Gary Sanders gave the group an overview of the work now under way around the globe as progress on TMT moves through the final design and production phases for various components of the telescope and its instruments. “We’re very far along. A lot of work is going on globally in a big and powerful international collaboration,” Sanders said. The TMT Future Leaders Workshop was organized and led by the Institute for Scientist & Engineer Educators (ISEE) at UC Santa Cruz. ISEE director Lisa Hunter said the workshop emphasized international collaboration and provided many opportunities for participants to apply what they learned by working in teams to propose solutions to problems currently being tackled by TMT. The intention is to train TMT’s future scientific and technical leaders. ISEE has a long history of working with major telescopes on education and workforce development programs. 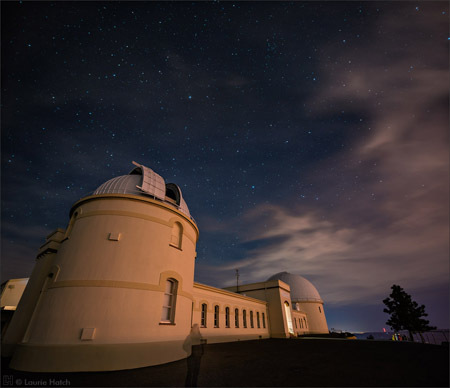 The institute got its start as part of the Center for Adaptive Optics at UC Santa Cruz and has been working with telescopes in Hawaii since 2002 and with TMT since 2009. In Hawaii, ISEE is best known for the Akamai Workforce Initiative, which provides internships, mentoring, and support for college students in science, technology, engineering, and math (STEM) fields. Telescopes face special challenges in creating a local workforce due to their remote sites and need for highly trained workers. 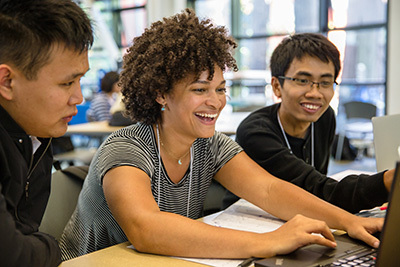 Akamai prepares local college students for jobs in telescope operations and contributes to the regional workforce by supporting students across a broad range of STEM fields. TMT is currently the major funder of the Akamai program, which has provided more than 350 internships to students from Hawaii. More than a quarter of the participants are native Hawaiian, and more than 140 Akamai alumni are now working in scientific and technical jobs in Hawaii. Maunakea in Hawaii was chosen in 2009 as the preferred site to build and operate TMT, but in 2015 the Hawaii Supreme Court ruled that the state’s permitting process was flawed. While proceedings to re-obtain the required permit move forward in Hawaii, TMT has also investigated alternative sites and last year chose a site in La Palma, on the Canary Islands, as the alternate site for TMT. When completed, TMT will provide new observational opportunities in essentially every field of astronomy and astrophysics. Its 30-meter primary mirror, composed of 492 hexagonal segments, will have nine times the light-collecting area of today’s largest optical telescopes, allowing TMT to reach further and see more clearly than previous telescopes by a factor of 10 to 100 depending on the observation. The segmented-mirror design, pioneered on the 10-meter Keck telescopes, was conceived by the late Jerry Nelson, a professor emeritus of astronomy and astrophysics at UC Santa Cruz and TMT project scientist, who died in June. Sanders paid homage to Nelson at the symposium, as did UCSC Chancellor George Blumenthal in his opening remarks. “His work empowered astronomers throughout the UC system and helped put us where we are today,” Blumenthal said. The light collected by TMT’s enormous primary mirror will be directed to a sophisticated adaptive optics system and a powerful suite of scientific instruments located around the telescope. The three “first-light” instruments to be deployed when the telescope begins operations—two infrared spectrometers and one optical spectrometer—will provide unparalleled science and imaging capabilities. 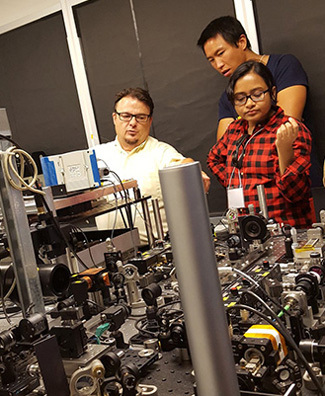 Work on the Wide-Field Optical Spectrometer (WFOS) is being led from UC Santa Cruz by principal investigator Kevin Bundy, one of many TMT collaborators who met with the workshop participants. The TMT Future Leaders Workshop was sponsored by TMT and co-sponsored by University of California Observatories (UCO). It is part of an International Training Program ISEE is developing in collaboration with the TMT Workforce, Education, Public Outreach, and Communication (WEPOC) committee. 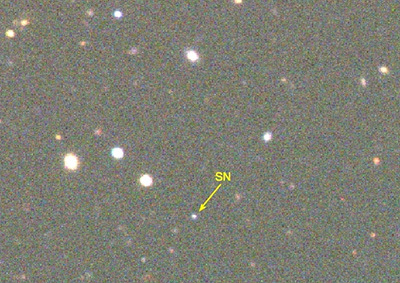 At a distance of 10 billion light years, a supernova detected by the Dark Energy Survey team is one of the most distant ever discovered and confirmed. The death of a massive star in a distant galaxy 10 billion years ago created a rare superluminous supernova that astronomers say is one of the most distant ever discovered. The brilliant explosion, more than three times as bright as the 100 billion stars of our Milky Way galaxy combined, occurred about 3.5 billion years after the big bang at a period known as “cosmic high noon,” when the rate of star formation in the universe reached its peak. Superluminous supernovae are 10 to 100 times brighter than a typical supernova resulting from the collapse of a massive star. But astronomers still don’t know exactly what kinds of stars give rise to their extreme luminosity or what physical processes are involved. The supernova known as DES15E2mlf is unusual even among the small number of superluminous supernovae astronomers have detected so far. It was initially detected in November 2015 by the Dark Energy Survey (DES) collaboration using the Blanco 4-meter telescope at Cerro Tololo Inter-American Observatory in Chile. 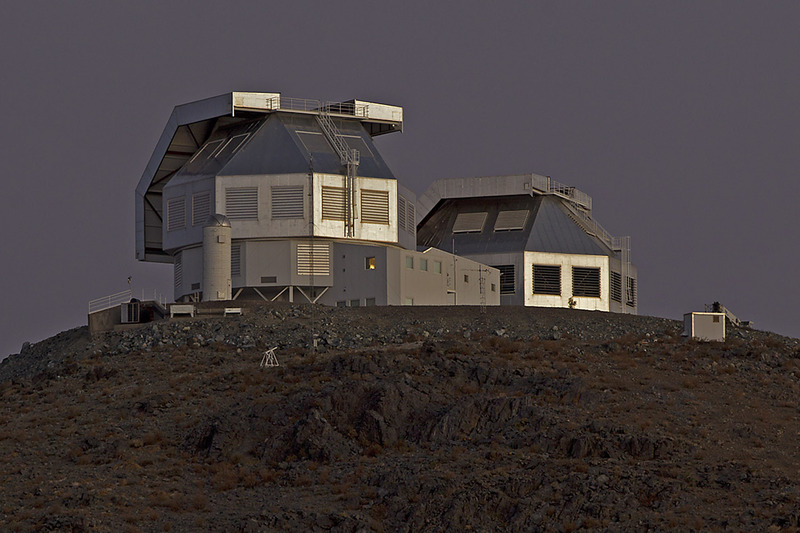 Follow-up observations to measure the distance and obtain detailed spectra of the supernova were conducted with the Gemini Multi-Object Spectrograph on the 8-meter Gemini South telescope. The investigation was led by UC Santa Cruz astronomers Yen-Chen Pan and Ryan Foley as part of an international team of DES collaborators. The researchers reported their findings in a paper published July 21 in the Monthly Notices of the Royal Astronomical Society. The new observations may provide clues to the nature of stars and galaxies during peak star formation. Supernovae are important in the evolution of galaxies because their explosions enrich the interstellar gas from which new stars form with elements heavier than helium (which astronomers call “metals”). Previous observations of superluminous supernovae found they typically reside in low-mass or dwarf galaxies, which tend to be less enriched in metals than more massive galaxies. The host galaxy of DES15E2mlf, however, is a fairly massive, normal-looking galaxy. “The current idea is that a low-metal environment is important in creating superluminous supernovae, and that’s why they tend to occur in low mass galaxies, but DES15E2mlf is in a relatively massive galaxy compared to the typical host galaxy for superluminous supernovae,” said Pan, a postdoctoral researcher at UC Santa Cruz and first author of the paper. Foley explained that stars with fewer heavy elements retain a larger fraction of their mass when they die, which may cause a bigger explosion when the star exhausts its fuel supply and collapses. “Although many puzzles remain, the ability to observe these unusual supernovae at such great distances provides valuable information about the most massive stars and about an important period in the evolution of galaxies,” said Mat Smith, a postdoctoral researcher at University of Southampton. The Dark Energy Survey has discovered a number of superluminous supernovae and continues to see more distant cosmic explosions revealing how stars exploded during the strongest period of star formation. In addition to Pan, Foley, and Smith, the coauthors of the paper include Lluís Galbany of the University of Pittsburgh, and other members of the DES collaboration from more than 40 institutions. This research was funded the National Science Foundation, The Alfred P. Sloan Foundation, and the David and Lucile Packard Foundation. The Dark Energy Survey is a collaboration of more than 400 scientists from 26 institutions in seven countries. Its primary instrument, the 570-megapixel Dark Energy Camera, is mounted on the 4-meter Blanco telescope at the National Optical Astronomy Observatory’s Cerro Tololo Inter-American Observatory in Chile, and its data are processed at the National Center for Supercomputing Applications at the University of Illinois at Urbana-Champaign. Funding for the DES Projects has been provided by the U.S. Department of Energy Office of Science, U.S. National Science Foundation, Ministry of Science and Education of Spain, Science and Technology Facilities Council of the United Kingdom, Higher Education Funding Council for England, ETH Zurich for Switzerland, National Center for Supercomputing Applications at the University of Illinois at Urbana-Champaign, Kavli Institute of Cosmological Physics at the University of Chicago, Center for Cosmology and Astro-Particle Physics at Ohio State University, Mitchell Institute for Fundamental Physics and Astronomy at Texas A&M University, Financiadora de Estudos e Projetos, Fundação Carlos Chagas Filho de Amparo à Pesquisa do Estado do Rio de Janeiro, Conselho Nacional de Desenvolvimento Científico e Tecnológico and Ministério da Ciência e Tecnologia, Deutsche Forschungsgemeinschaft, and the collaborating institutions in the Dark Energy Survey, the list of which can be found at http://www.darkenergysurvey.org/collaboration.